In many cases it is possible to enhance the properties of an emulsifier by combining it with another emulsifier. An example of this is the mono- and diglycerides, that achieve their optimum suitability for use in flour treatment through combination with lecithin. The lecithin improves their solubility and dispersion, and clearly their interaction with constituents of the flour as well. Well-known and widely used organic flour improvers fall into this category. The combination makes it possible to reduce the dose necessary for optimum effect to 100 - 300 g with 50% emulsifier in the complex. 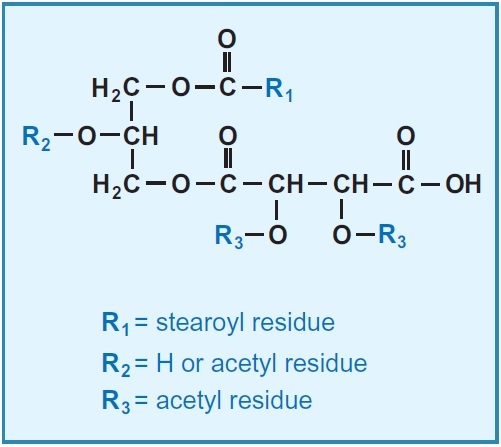 Diacetyl tartaric esters of mono- and diglycerides are also receptive to enhancement with lecithin: the addition of as little as 10% lecithin improves their emulsifying effect and also reduces the vinegar smell. The above combinations are only effective if the emulsifiers are mixed before being converted into their powdered form. Interestingly, it is not sufficient just to mix the individual powdered components. One very effective group of emulsifiers in respect of volume yield is mono- and diglycerides of edible fats esterified with mono- and diacetyl tartaric acid. DATEM is a heterogeneous mixture of molecules derived from esterification of acetic acid, tartaric acid and fatty acids (bound to glycerol). Some of the resulting emulsifier molecules are more active than others. The structures shown in Fig. 131 were the most efficient in bread baking trials (Köhler, 1999). Both molecules were derived from glycerol monostearate. But most probably the other molecules do have a co-emulsifying effect, which means that the mix is more effective than a single, purified emulsifier. DATEM is one of the main constituents of most baking improvers, especially when the aim is to produce voluminous baked goods with a crisp crust. DATEM is not often used in flour treatment; its main application is in bread improvers utilized in bakeries. The optimum dose is about 300 - 400 g to 100 kg, but for reasons of cost the dosage is often reduced to as little as 150 g.
These emulsifiers are made from the fatty acid stearic acid esterified with a double ester of lactic acid. The remarks concerning DATEM also apply to these, but with the difference that SSL and CSL are especially suitable for baked goods with a soft crust. Furthermore, they have a better effect on the retention of crumb softness. Tab. 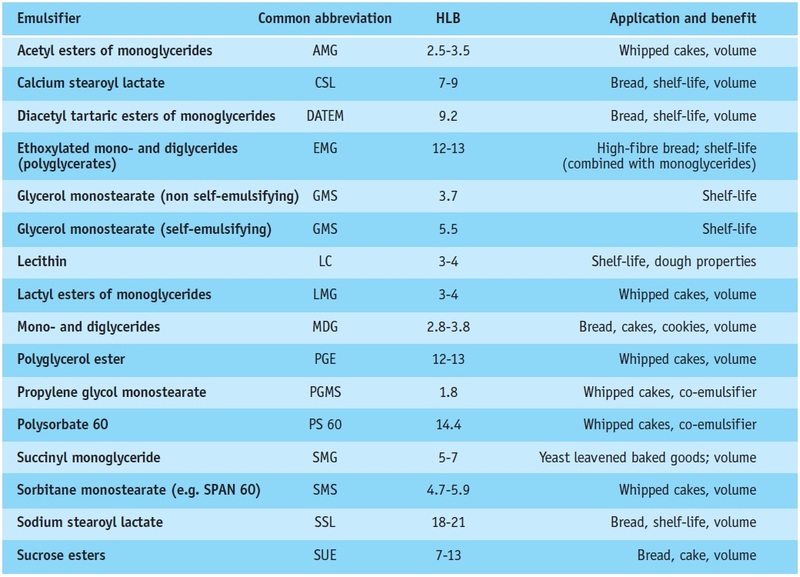 92 summarizes the emulsifiers suggested for baking. Sucrose esters seem to be interesting since they are produced in a wide range of HLB (hydrophilic or lipophilic). The high-HLB variants, especially, have a good effect on volume yield and crumb structure at quite low dosages, but the price is still much higher than that of conventional baking emulsifiers.